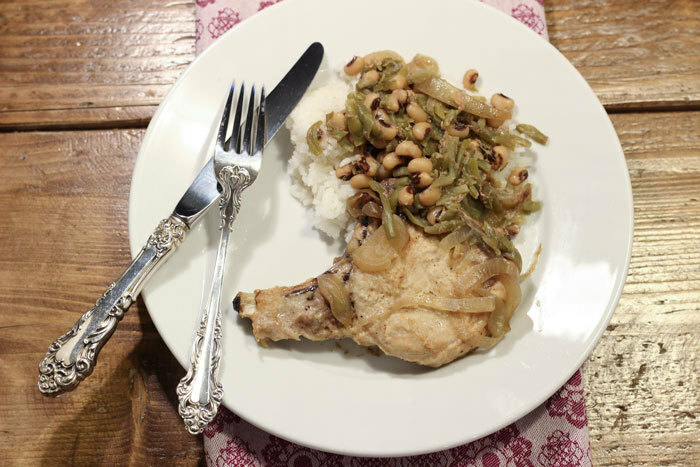 This old Southern Living slow-cooker recipe is a standby in our house. We use it on busy weeknights or Saturdays when we know we are going to be skiing or at a tournament or something. This Saturday, we knew that we were going to be busy prepping for Thanksgiving. Or in my case, watching the LSU game. 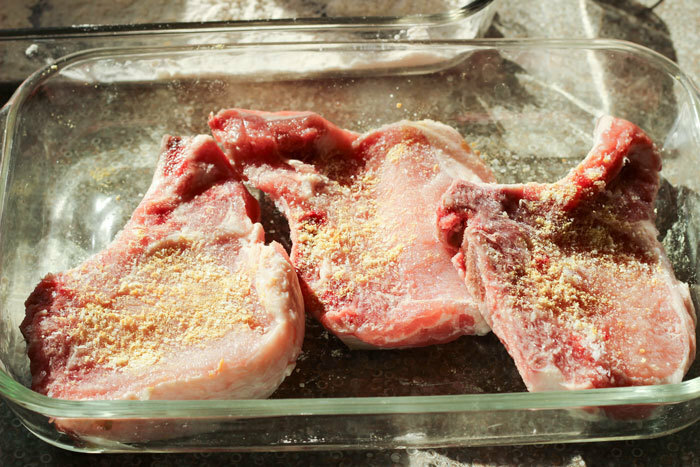 The recipe calls for bone-in pork chops and I highly recommend that you use them. I’ve tried it without and let’s just agree to learn from my mistake. The bone and the fat that comes with this cut makes a difference in the flavor. When done, the pork will fall off the bone easily, so you won’t have to worry about those pesky bones in the end. Also, don’t be afraid of the size of this recipe if you have a small family (or just two). We never have leftovers, but I hear reports from others that this freezes really well once cooked. You are doing the work anyway so throw a couple extra pork chops in for a later meal. Because this is a crock-pot recipe, the prep is pretty simple. Dump a bag of frozen black-eyed peas in your slow cooker. I also dump a bag of frozen green beans. My aunt uses white beans when she makes this recipe and says it is great. You do have to season and brown the meat before throwing it in. If you are adding extra chops (or just want a little extra flavor), double the seasoning mixture and rub it on rather than sprinkling it on. This does make the meat more flavorful. Once your meat is browned and in your crock-pot, sauté your onion in the pork leftovers (add a little olive oil if you have lean pork chops), then add a bit of chicken stock to pick up the sticky stuff on the bottom of the pan. The recipe calls for condensed chicken stock, but I think that’s a holdover in southern cooking like garlic cheese roll that no one else actually uses. Just use regular chicken broth. It’s fine. Dump those onions and the entire can of stock into your pot on top of the beans and chops. Do add a bit more salt and pepper to the mix, maybe even some creole seasoning if you have it. Now, go watch the game or go to work or whatever it is you do. We serve this with brown or white rice (depending on when I remember that the rice needs to be made). Dig deep when serving to get all those beans out. My boys would tell you to add a little hot sauce. I think creole seasoning does the trick, but that’s just me. I didn’t even make a salad to go with this last night. What a slug. Oh, and tonight, we are having steak with baked potatoes and broccoli. The birthday kids didn't want to pick anything for dinner nor do they want to pick cakes. We are having brownie sundaes. More on the celebration later.